CULTURE OF REVOLUTION · Intentional Destruction Destroy value IN THE LATE 1980s, Bill Gates dreamt about a future where learn- ing would be digital. He took his dream to the Benton Foundation, which owned Britannica, the leading encyclopedia. Benton turned Gates down, worried about cannibalizing their printed book sales. Years later, Gates bought the rights to the Funk & Wagnalls Encyclopedia, a third-tier brand available in grocery stores. In 1993 the content was dig- itally re-launched under a new brand, Encarta. 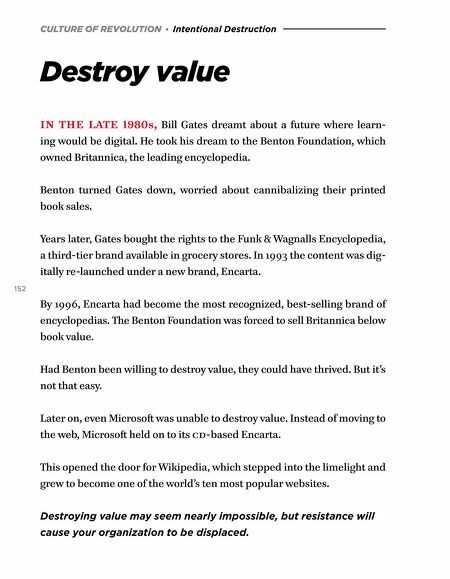 152 By 1996, Encarta had become the most recognized, best-selling brand of encyclopedias. 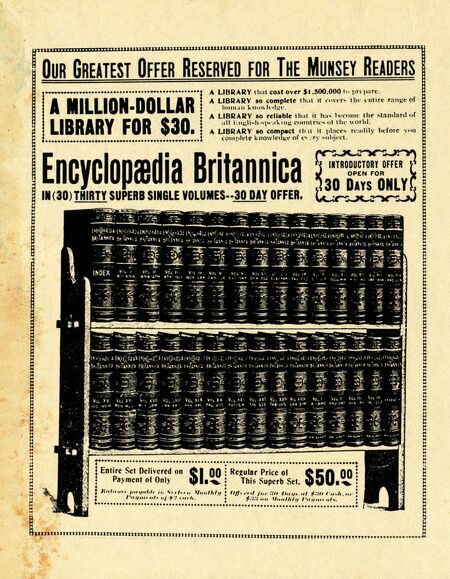 The Benton Foundation was forced to sell Britannica below book value. Had Benton been willing to destroy value, they could have thrived. But it's not that easy. Later on, even Microsoſt was unable to destroy value. Instead of moving to the web, Microsoſt held on to its cd-based Encarta. This opened the door for Wikipedia, which stepped into the limelight and grew to become one of the world's ten most popular websites. Destroying value may seem nearly impossible, but resistance will cause your organization to be displaced.